L-shaped bunk beds can be a space-saving solution for rooms with multiple children or even dorm rooms or roommate situations. They often have two beds oriented in a different position, to conform less to the stacked-bed design and give room for storage. We’ve brought together the best bunk beds for you – and we know you’ll find what you’re looking for! But before we get started, let’s take a quick look at some things you should know. Material: This is what the frame of the bunk bed is made of. On our list, this basically only refers to wood and metal, and not the different types of wood. Most common among these are pine and walnut, however. Access: How do you get up to the top bunk? This can be with steps up the side of the bed or, more commonly, a ladder. This is effective enough while saving space and keeping it simple and sleek. Size: This refers to the size of the beds that can fit on the bunks. Mostly, bunk beds are made with twin beds in mind, but some have spaces for full-sized beds so that you sleep multiple kids in them. Finish: What color is it? This is usually referring to what color the wood that the bed is made of has been stained. This can be a dark color or a light one, or sometimes it’s left natural. Dimensions: The size in inches of the furniture can tell you if it’s going to fit in your space. It will also tell you how big the different parts are so you can order something that’s closer to what you want. Warranty: The warranty protects the parts the bed is made of from damage caused by manufacturing errors. You could get a refund or replacement of the product within this timeframe if something breaks during normal intended use. Now that you know what to look for, we will get to our bunk bed reviews! We’ve done all of the research so you don’t have to, and we’ve brought you a selection of ten beds that we’re sure will fit all of your needs. The top pick and budget pick are the best, but if those aren’t what you’re looking for, there’s plenty more where that came from! Let’s get started with the products! Our choice for the best bunk bed is this Plank & Beam model. It’s a unique look that’s sure to delight your children! The top area is railed in, and the bottom is full of storage! One one end of the bottom of the bunk bed is a desk with a drawer, perfect for doing homework. On the other side is a slim four-drawer dresser for clothes and other storage, as well as three open shelves you can use to hold books and other things. It’s constructed sturdily with New Zealand pine, so it will last your family a long time! We love all of the additional features that come on this L-Shaped bunk bed with desk attached. The ladder even has grooves in the steps to make it more comfortable to get to the top bunk. Both levels have standard twin mattresses, so it’s great for siblings! You could even use it in your college dorm. 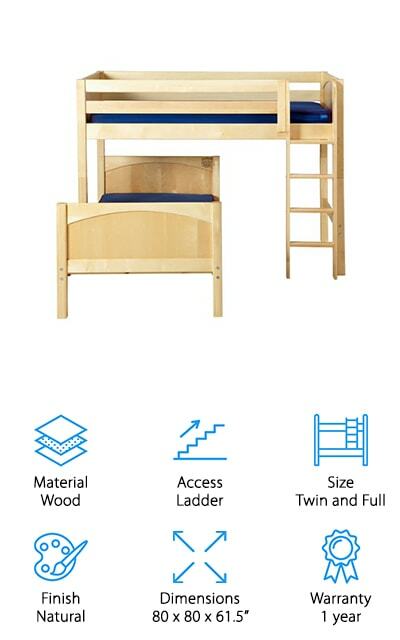 These cheap bunk beds by South Shore are the perfect dorm staple! They come with two beds, neither of which have rails. One the bottom side, there’s a minimalistic, functional desk with a built-in light that is perfect for getting everything done. The rest of the space is taken up by shelves and storage – and you can fit so much onto this bunk bed set with minimal space! We love the design of this sturdy bunk bed. It’s made of wood and finished with a beautiful white, so it’s elegant as well as functional. It’s sturdy enough to support 200 pounds on the top level. All the corners are rounded so you can stay safe, and have we mentioned how much we love the different storage options? There’s a two-sided bookcase on one side and a smaller shelf ensemble on the other. 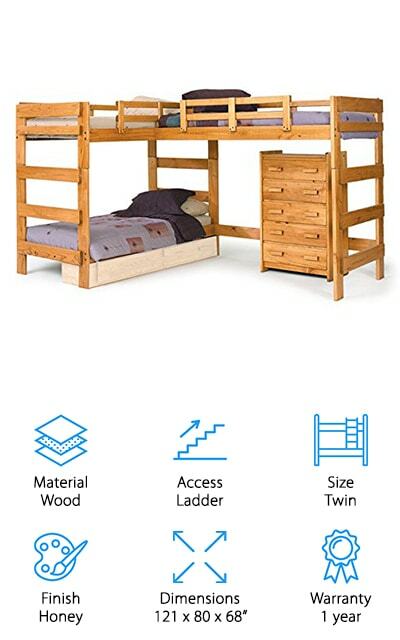 We know that you’ll love this amazingly affordable and functional bunk bed set! 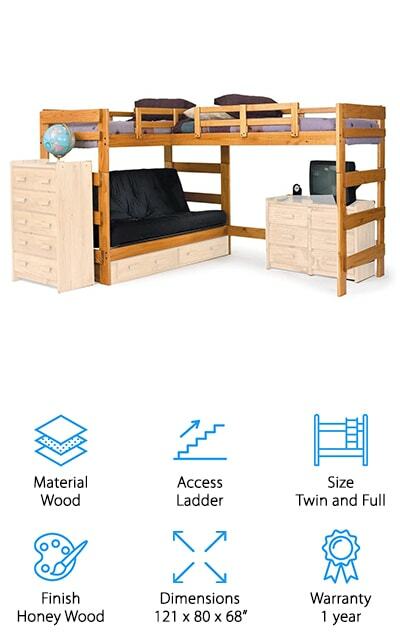 Get ready for this amazing 3-bed bunk bed set. 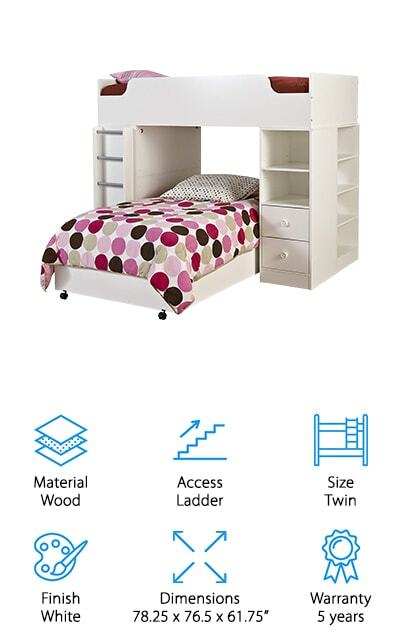 It’s a great L-shaped bunk bed for kids, and perfect for sleepovers and large families! There are two twin bunk beds on the top, with a fold-out futon on the bottom. That leaves plenty of space for dressers or other furniture to complete this hangout area. If you have twins or other children that are similar in age, this is going to be the perfect piece to go in their room. As a bonus, they can have friends over to sleep on the bottom full-sized fold out area. We absolutely love how much can be done with this set to save space in smaller rooms. It’s made of solid pine wood that won’t buckle on you anytime soon – it’s strong and durable, and this bed will last you a long time. We love the extra storage space under the futon as well as the simple rail design for getting up top! This quality bunk bed from Maxtrix is a great addition to any kids room and will grow with them. Though it is an L-shaped bed, it also comes with a convenient kit that you can use to rotate the bottom bunk to align with the top. The bottom is a full-size bed, so this is perfect for rooms with smaller spaces. It also comes in different finishes, including white, natural, and chestnut finishes. It’s a fairly simple set up that has been shown to be effective! The top bunk is accessible by an angled ladder with comfortable grooves so it’s easy for your child to get up and down from the top bunk. There are rails all the way around this top section to keep your kids from rolling out of the bed in the middle of the night and to discourage climbing down without the ladder. We love the simple but functional design of this bunk bed! Chelsea Home is back on our list with this rustic and fun bunk bed. The finish on all of the parts is a natural, raw wood look. There is a smaller gate in the front of the top bunk rather than an all-around rail. This creates a nice stylish look that is unique on our list. On one side of the bottom, bunk is a dresser with five drawers, as well as a bookshelf on the end. We love the natural wood grain on this set and all of the storage that comes with it. It’s great for your kid’s room or a dorm room. The bottom bunk is a full-size bed while the top is a twin, which is also great sleepover real estate. The other end of the bed is the ladder that you use to get to the top bunk, and we love that. It’s a very classic design that will spice up any bedroom! 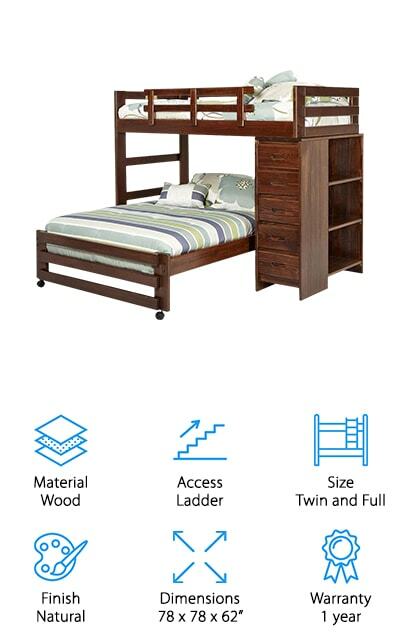 Discovery World Furniture makes this naturally beautiful, sturdy bunk bed set! It has a beautiful, deliberately wood grain finish that will help it endure any style, so it’s great for any room. The full bunk bed on the bottom comes with rollers to make it easier to move, and the side is a dual cubicle bookcase and six-drawer dresser. The drawers on this dresser roll easily and are spacious enough to hold clothes and toys. That’s three drawers for each bunk! It’s a great addition to a bedroom shared by siblings, no matter the age difference. 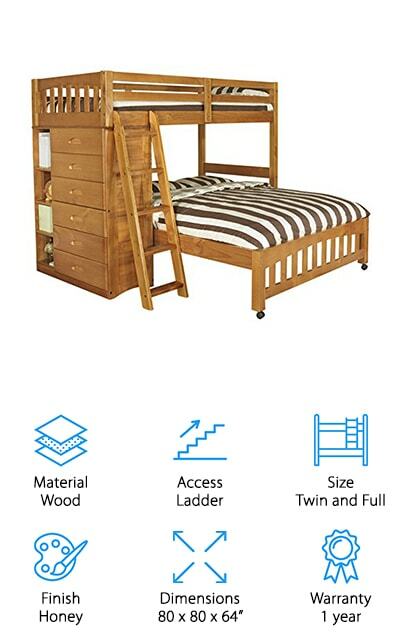 We really love this design, and it’s topped off by a comfortable and wide-rung angled ladder to make getting into and out of the top bunk an amazingly pleasant experience compared with some other bunk beds. The top twin bed is entirely railed in for younger kids, while the bottom is full, so it can even sleep two if there’s a sleepover! This Chelsea Home bed is perfect for three kids! It’s one of the only beds on our list that accommodates three different twin-sized mattresses. It’s a simple design, but it can be a lifesaver if you’re looking to save space. The area under the second bunk is great for storage or other dressers, and we absolutely love that. Anything that will save space is absolutely amazing! This wood is extremely sturdy and comes with clear instructions on how to assemble the piece, so don’t be intimidated! Two adults could easily get this bunk bed up and ready in no time. Each of the three beds is great for holding up to 250 pounds, so it’s perfect for your kids! The pine is stained a honey color, beautiful and stylish. It will easily fit with any kids room décor! We love the design of this bed set and how perfectly it could work for larger families! 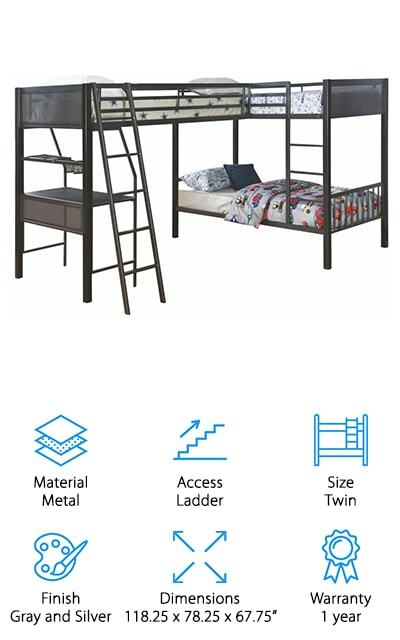 This Ballarat Bunk Bed is the only one on our list with a metal frame. It can also accommodate three twin-sized beds, and the design is sleek and modern with its black and silver finish. Each bunk bed has their own ladder separate from the frame, and underneath there is an attached desk to create a workstation. This is great for space saving! The shelving units here are wide and can hold quite a bit of accessory, books, or other things to really make this bed space your own. A small chair is a great addition to this set. It’s a great set for slightly older kids, and it will be a few years before they outgrow it! The three mattress areas are strong and sturdy, and it works well in the corner of the room so you can use the rest of the space effectively! We love the finish and design of this delightfully planned bunk bed set. This dark wooden frame by Camaflexi is simple and effective! There are no fancy ending bookshelves or drawers, so if you’re looking for something a little more sleek and modern this is the best bunk bed for you! The top bunk is a twin and the bottom is full – and the best part about this bed is the fact that they can come apart! You can make two separate beds out of this one system, which is perfect for siblings as they grow. It’s also a good idea for dorm rooms because you can choose to arrange and rearrange it however you’d like. It’s made of solid wood and finished with a dark brown that is absolutely gorgeous. 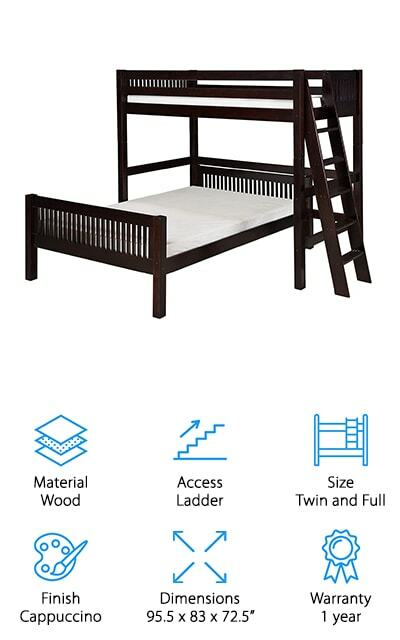 The ladder is comfortable, grooved, and sturdy enough to get you right into the top bunk with no hassle at all! Whatever your situation, this bunk bed can provide you with a space solution and the beautiful, classic look that you want. This loft bed is a great addition to our list! The bottom bunk is a standard twin-sized mattress with a full-sized mattress in the loft, which is a unique configuration that isn’t as popular as having it the other way around. It’s a classic style that will work well in many different décor settings, and it’s made of one hundred percent solid wood. 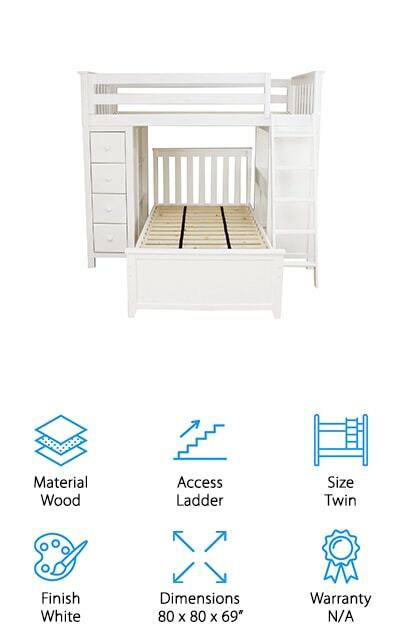 What we love about this set is that the top bunk is detachable when your children grow out of the bunk beds. This creates two separate beds, which is definitely a lot of value in this set. 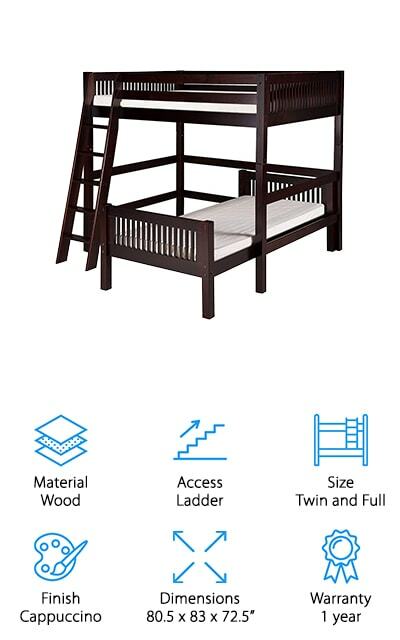 The ladder has extra-wide grooved rungs, so it’s just as comfortable to use as one on an L-shaped bunk bed with stairs. Your kids are going to love this bed set for a long time – so it’s a great investment! It’s a sturdy construction that will support a total combined weight of 650 pounds. That’s amazing!